With the presence of a caregiver who provides non-medical home care in Opitz Boulevard Woodbridge VA, the elderly will have someone to talk to at home. This is most especially necessary if their children already have families of their own. However, in the long run, both the caregiver and the elderly may notice that everything becomes a routine already. 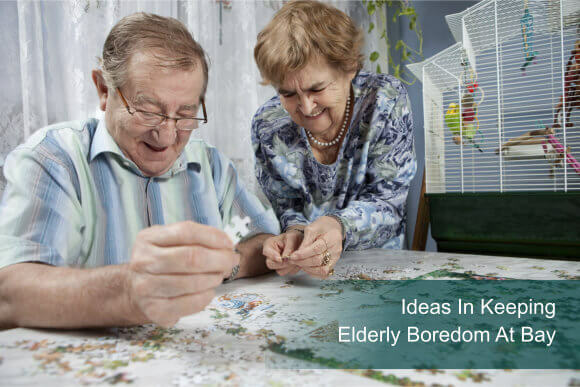 Here are some great ideas on how you can keep elderly boredom at bay. There are already a lot of video games available in stores nowadays. Some of these games typically simulate real-life movements. Playing video games such as Just Dance or Wii Sports will not only be fun for your elderly, it can also help exercise his motor skills. He can play it alone or with his caregiver. Playing board games can help the elderly stimulate his brain. These board games can provide mental exercise to keep his brain sharp and active. Aside from board games, he can also make use of puzzles and crosswords. Set up a mini bird sanctuary. A relaxing hobby that the elderly can start doing is bird watching. In this case, he, with the help of his caregiver or a family member, can set up a mini bird sanctuary right in his own backyard. In order to build such sanctuary, a shelter, birdbath, and feeder, among other things, should be present in the area. After setting up the sanctuary, your elderly can just sit back and relax while watching various birds take a rest. If your elderly does not have any allergy towards pets, you might want to get him one. A pet can actually become a stress reliever and good companion for both the elderly and the caregiver. Make sure that you know what pet your elderly might like. Also, see to it that the things that the pet needs are already available. There are numerous clubs that are good for senior citizens. Through these clubs, the elderly will be able to engage in activities that boost their social skills. Aside from that, these activities may also help them maintain their physical health and improve their mental and emotional well-being. Some of the clubs that they can engage in are book clubs, cooking clubs, chess clubs, and the likes. Just see to it that the caregiver will be able to monitor his activities and ensure his safety. OptimumCare Home Care Services sees to it that boredom will not strike on your elderly. Our friendly caregivers know how to deal with patients with different personalities. Call us at 703-490-8003 to engage our services.